Update October 7, 2016: We are pleased to announce that the rezoning bid put forth by Goucher College was approved at the hearing on August 30. We will continue to update our website and inform our community as plans progress. Our vision for Goucher College is to become the model for an affordable and transformational education, integrating curricular and co-curricular learning. The Goucher experience will give graduates analytical and problem-solving skills that will help them engage in real world interactions. Their education will also help students adapt in a rapidly changing world. While tuition will remain our main source of revenue for some time to come, we realize that simply raising tuition year after year is not a viable option. We want to continue to provide an excellent education to a broad range of students. We also need a sustainable budget while we attempt to become more affordable. To help us fulfill this mission and reach our goals, we have looked at our assets and asked: What can we do that would support our core mission, but still diversify our revenue sources? For example, we have expanded the number of summer rentals of our facilities. We have also been looking for local partnerships: ways to share our land with our community that will be mutually beneficial. This fall, we will welcome the Maryland Horse Breeders Association to our campus. They will rent space on our campus for their offices. Those offices will be located near our nationally-ranked equestrian team, along with our new Equine Studies minor program. We hope this will lead to further collaboration of facilities and internship opportunities for our students. We are equally determined to preserve the natural beauty of our campus. There is a parcel of our land located prior to the main entrance (please see map) that is bordered by Dulaney Valley Road, Sheraton hotel (a 12-story hotel) and an office building zoned BMCT (commercial), Edenwald (a 19-story high-rise senior living community), and our main entrance road. These adjacent buildings are here because Goucher previously sold this land to remain fiscally viable. We would like to avoid selling more land and, instead, lease the land to generate additional annual income. This preserves the asset for Goucher’s future and gives Goucher control over what happens to the land. It also sets up the college for additional revenue and further amenities. The way we use this land is important to our past, current, and future students, as well as our Towson neighbors. On the one hand, this plot of land is surrounded by tall buildings. If we needed a campus building taller than two or three stories (for administration, auxiliary services, medical services, or a bookstore, for example), this would be the place to do it. We also realize this is the front door to our campus, so we want something attractive, with trees and grass. We also do not want to create traffic problems for our neighbors or our own visitors. We believe we can manage all of this by creating a solid plan. That plan will be some combination of a conference center and hotel, along with some residences. Goucher would like to host more conferences, and we have a perfect location for it. A conference center could also work in tandem with a renovated Kraushaar Auditorium or Arts Center. Both conferences and our limited-residency graduate programs require a place to sleep, but there is a shortage of midrange hotel space in Towson. We also find that our current residence halls are more comfortable for summer camps than graduate students. Parents also visit their students more often, and we think some hotel space works well with a conference center. Another option under consideration is residential space. Our plan is to build apartments, which can be subsidized for faculty, but also include new neighbors who want to live near a beautiful college campus. Finally, there would need to be some amenities and retail support, like the Goucher Pilates center or a bookstore. Our plan has been to limit what should go on this piece of land (balancing college and community desires with our revenue needs). We have partnered with a new civil engineer who is developing a plan that will be delivered in the coming weeks. That plan will allow us to put out a request for proposals (RFP) for developers who might want to lease the land, invest their own capital, and run the facilities. Many colleges have agreements like this for the same reasons. It provides annual income, preserves college assets, and gives the college an ongoing voice in how the land is used. Some recent examples include Johns Hopkins University, University of Maryland, Boston University, MIT, and University of Pennsylvania. As we started to have these re-zoning discussions last year, we were informed that Baltimore County has a once every four-year zoning cycle and that we needed to apply in October 2015 or wait four years. While not yet completely sure of our plans, we knew that the current zoning of this 8.62 acres was a combination of various zones with lines running across the property and that if we wanted to explore any additional facility options, we would need to get the property rezoned. Maintain our commitment to access and affordability to all who want to attend college. We have asked Baltimore County for BMCT zoning. This would allow for all of the uses stated above and is the same zoning held by both the Sheraton and the Towsontown Mall. 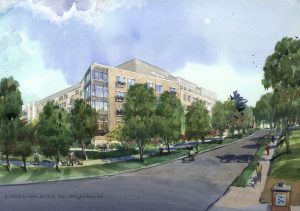 Our neighbors in Towson Gate Condominiums and at Edenwald were justifiably nervous that the BMCT zoning would allow for less desirable uses. Our neighbors have asked us to exclude some uses that would be allowed by zoning, and Goucher College has agreed to this. Goucher has continued to negotiate with legal representatives of both of these groups as well as the Edenwald Residents Association to create a covenant agreement that would be attached to the property. Even with BMCT zoning, Goucher College will not allow the property to be used for businesses beyond what is agreed to in the covenants for the agreed-to period of time. We have continued to meet and exchange covenant agreements with our neighbors this summer. I am confident that we have worked out the issues in a way that will be mutually agreeable and beneficial to all sides. The lawyers are hard at work as the final zoning decision is due to be made in late August. I hope we can finalize all of the details in time. It is very important to me and to Goucher that we be the best neighbors we can be. Goucher is committed to maintaining access and affordability to all who want to attend college. That is a social goal. We are in the hope business. We try to expand possibility. Community is essential for what we do, and we can’t expect our students to live up to our ideals if we don’t. With 1,500 undergraduates living on our campus, Goucher would never build something that did not support our core mission: educating students to be leaders and contributors to society. Still, I simply do not know today what developers will say or what the future may bring. There are almost certainly things we cannot anticipate and I need to preserve some flexibility for the college, while respecting the wishes of our neighbors. The drawings on the website represent what we would like to build on our property: a combination of residences, a hotel and conference center, and some office space, along with ample parking. We will continue to update our Goucher community and Towson neighbors about our progress. We want to create an open dialogue. We also want to be able to use our property in a way that complements the mission of our college.